The DyStar Group has released its 2015 Sustainability Performance Report. This is the sixth year of reporting for the company that aspires to become the world’s most sustainable and responsible supplier of colors, chemicals and services to the global textile industry. The latest report is their first to be aligned with the Global Reporting Initiative’s (GRI) G4 reporting guidelines. Building on more than half a decade of focused commitment by teams across 23 countries, the report reviews the company’s environmental, social and economic performance over the 2015 fiscal year. 2015 marks the halfway point toward DyStar’s environmental target, which aims to reduce resource consumption and waste production intensities by 20% by 2020. Results across all key performance indicators were positive, with energy intensity, in particular, showing a 16% reduction compared to 2011, despite production volumes going up by 14% over that same period. These achievements have triggered new impetus across DyStar. Inspired by the triple bottom line principles, they identify, in this latest report, four key aspects that constitute the company’s commitment to sustainability. 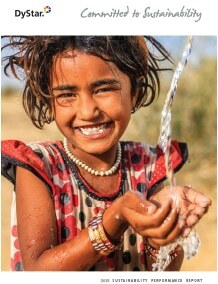 To access DyStar’s sustainability reports, visit the company’s website at https://www.dystar.com/sustainability-reports/.